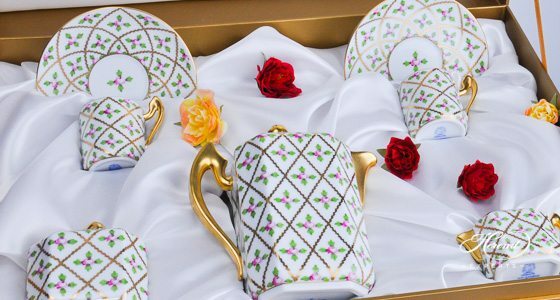 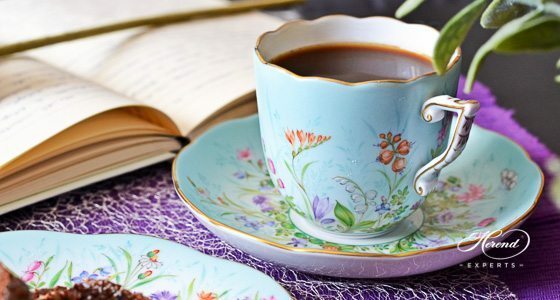 A special Herend Coffee Design that is limited to 15 sets. 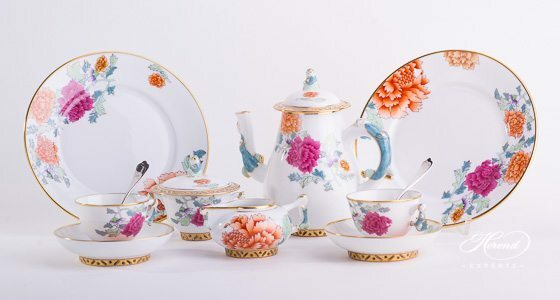 Apponyi Platinum is a modern variant of the original Apponyi - Chinese bouquet. 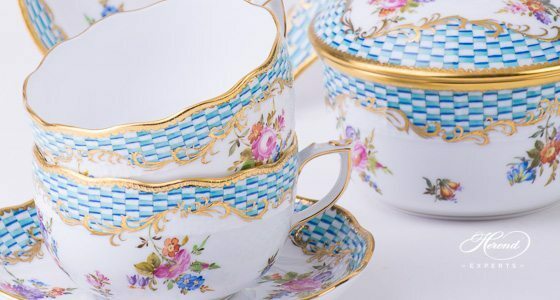 Painted with turquoise and platinum, instead of the traditional Green-Gold. 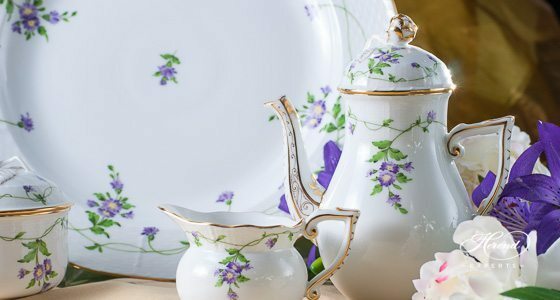 The Herend decor is named after its first customer Count Albert Apponyi. 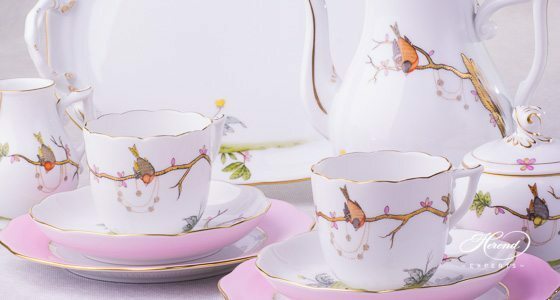 The Dream Garden (REJA, REJAR) Herend decor is based on the separation of living and non living elements and highlights the magical moment of the original Rothschild Birds, in a surreal garden, one that we can only dream of. 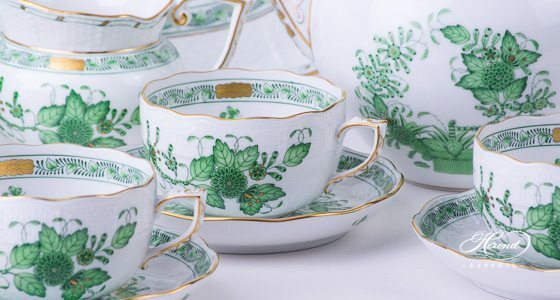 The Berried Fruits – (BAC) the wide white surfaces – and of course Green rims. 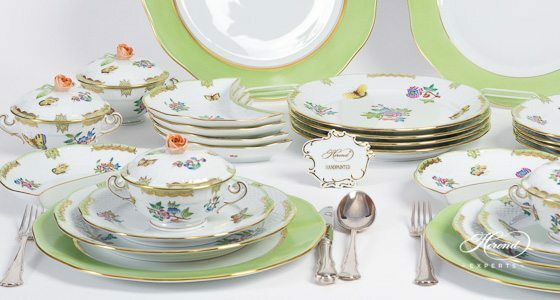 Herend Service is a fresh theme with detailed Fruits and Leaves. 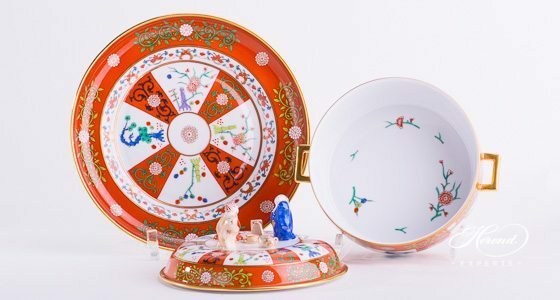 It is a good choice for Young Couples. 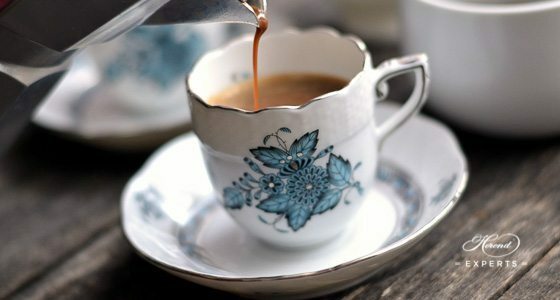 You can order this in Tea Services, Coffee Services, Mocca Services and Dinner Services! 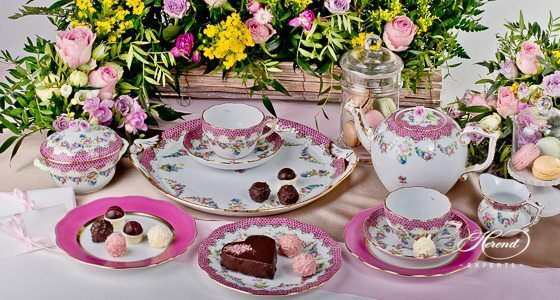 This novelty which debuted the year 2011 was created in celebration of the Victoria's anniversary, presents with perfect elegance and harmony, the new dimensions and modern color variations of the pattern. 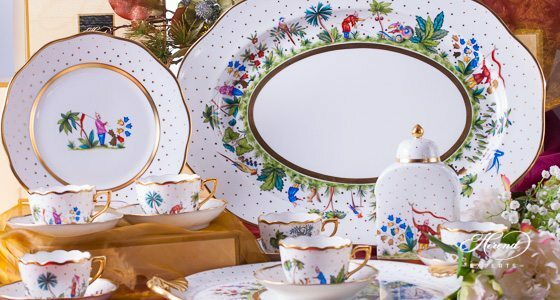 Jardin Zoologique pattern has been part of Herend's collection since the 1930s. 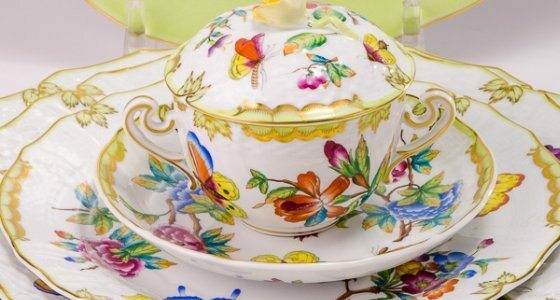 Hidden butterflies and birds can be discovered in the floral ornamentation interlacing the whole surface. 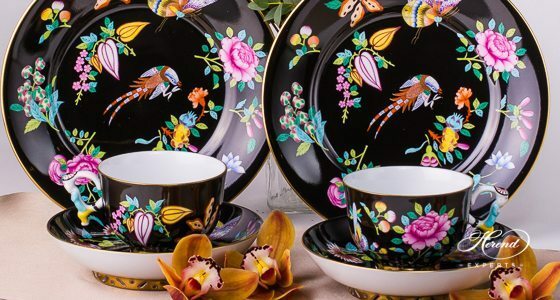 The rich and usually dense motif symbolizes the lush flora and fauna of a tropical forest. 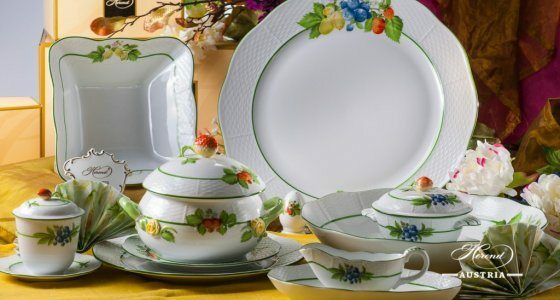 Festival of Fruits (FEST) is a new, Modern Pattern from Herend Porcelain Manufactory. 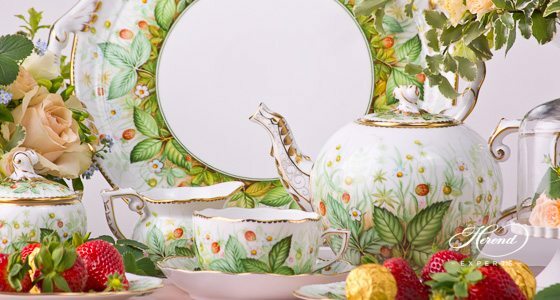 Based on Berry Fruits and Rich Gilded Decor. 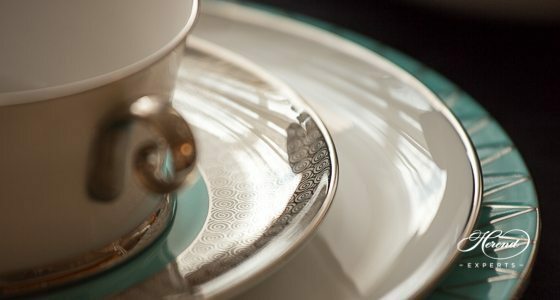 Tea Sets, Coffee Sets, Mocca Sets and Dinner Services are available. 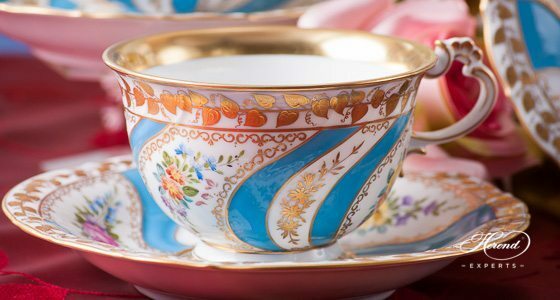 The Miramare Herend Porcelain decor was first made for the Castle Miramare located at the Gulf of Trieste northern Italy. 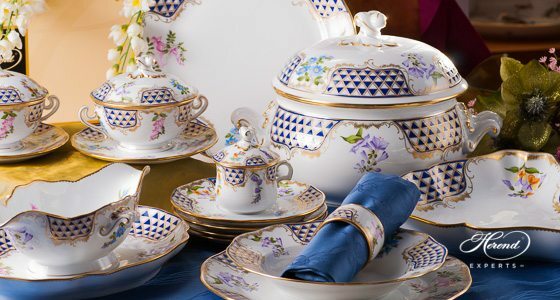 Once owned by the Habsbourgs, this decor was made for them, rich guilded, as a symbol of Power and Wealth. 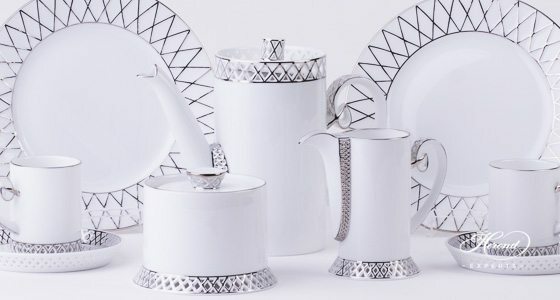 Tea Coffee Mocha and Dinner sets are available. 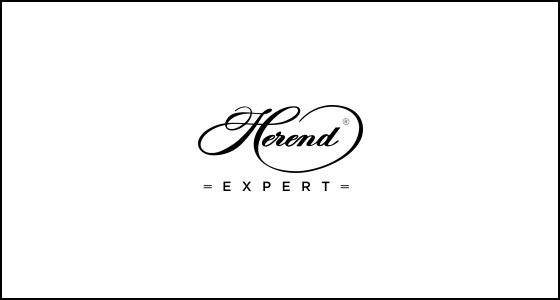 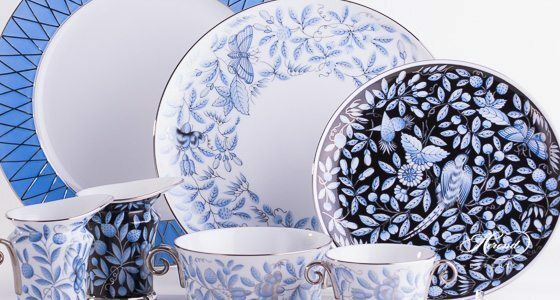 Four Seasons (Quatre Saison – QS) Sets are representing the highest quality of Herend. 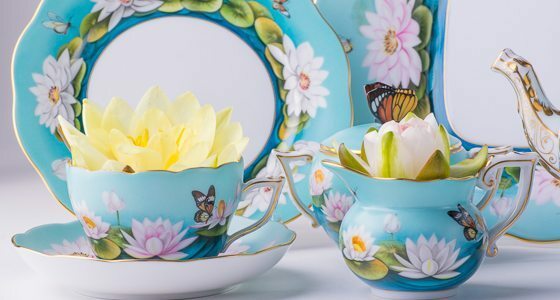 Blue sky, Fields and Flowers with the finest details – a real artwork on every porcelain. 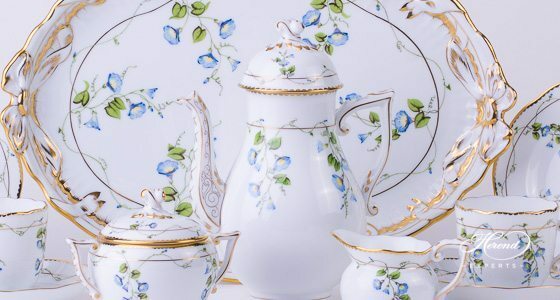 An oriental pattern inspired in the 1870’s by the Arabian Nights. 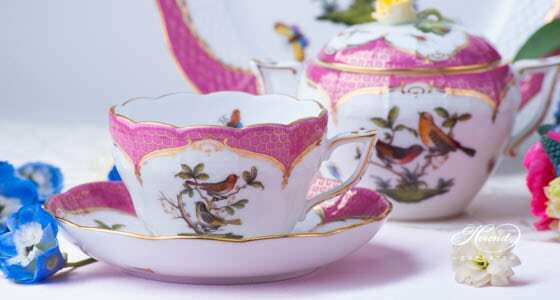 Even the Shah of Persia has orderd it around 1900’s. 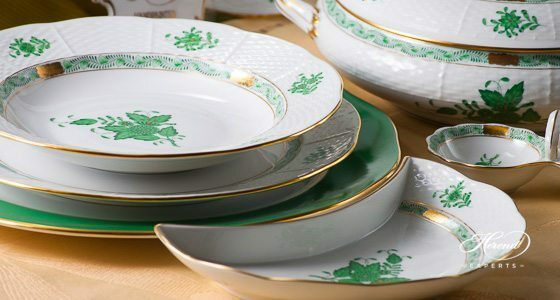 The Tupini Pattern was first ordered by the Famous Italian family: Tupini. 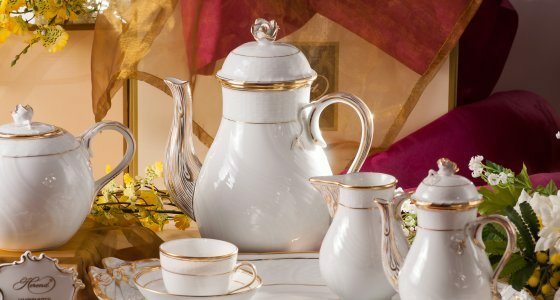 An elegan rich guilded decor. 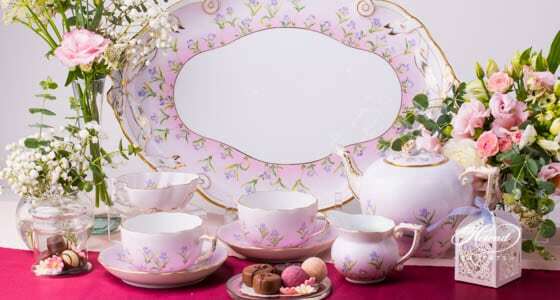 Tea Coffee Mocha and Dinner set can be ordered. 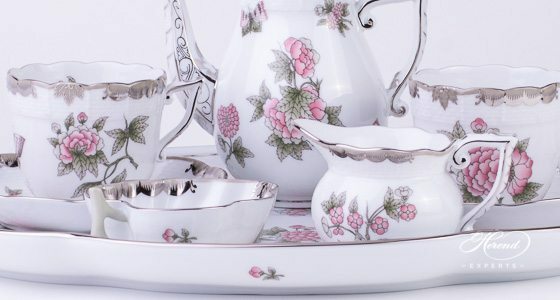 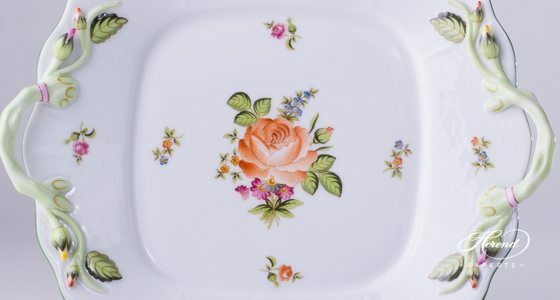 The MTFC pattern Herend Service family is one of the top level, of their product range. 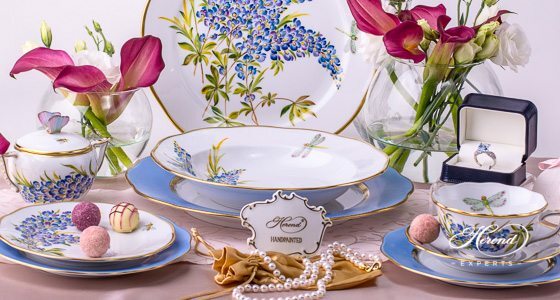 The Mosaic & Flowers services are rich in blue and gold triangular decors, also decorated with Wild Flowers as the Pansy, the Bean Flower, the Madonna Lily, the Daisy and Petunia. 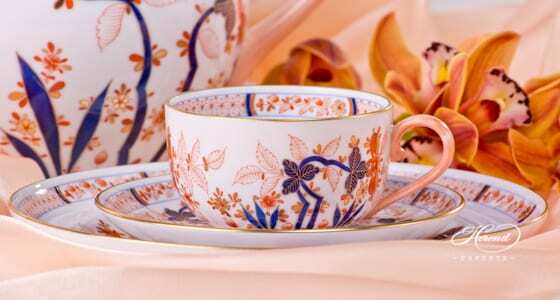 Tea Services, Coffe Services, Mocca Services and Dinner Services are availabe in this design. 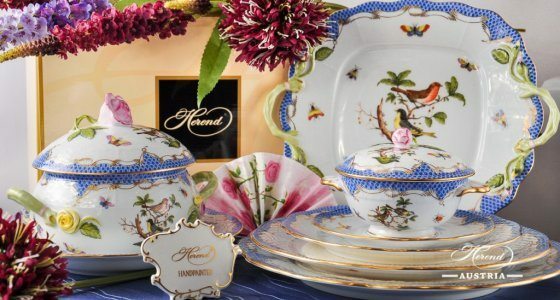 Rothschild Birds (RO) Herend Services are originally coming from the family story of the Rothschilds. 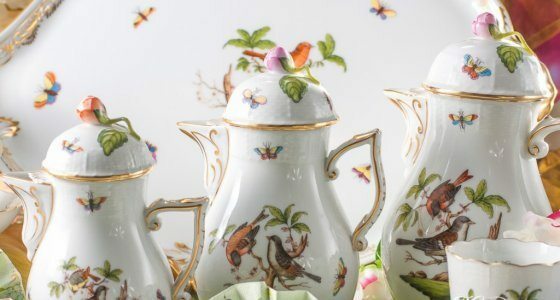 The famous Pair of Birds and the Golden Necklace is beloved decor since many years. 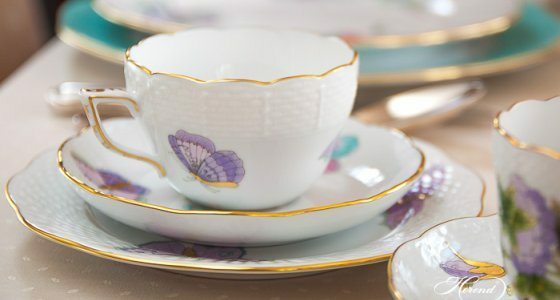 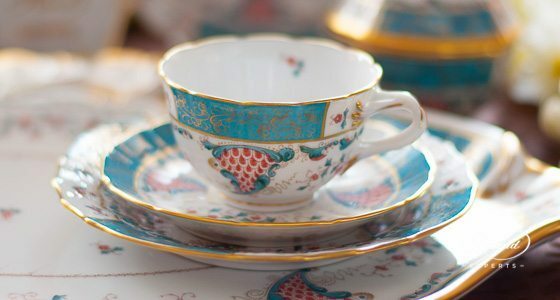 Tea Services, Dinner Services, Coffee-Sets and Mocca-Sets are available. 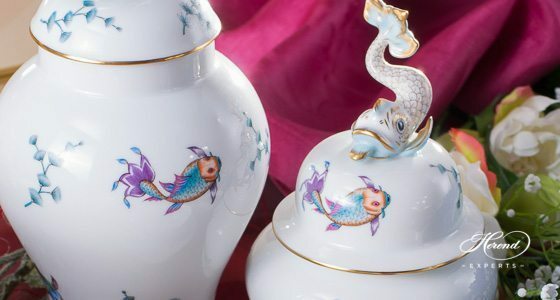 Couple of Birds Décor with Blue Fish-scale is a version of edge to the original decor RO. 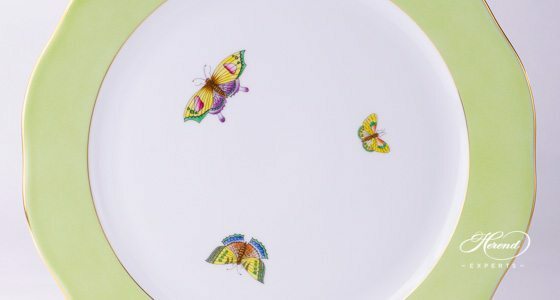 More than 15 types are available depending on the colour of Fish-scale. 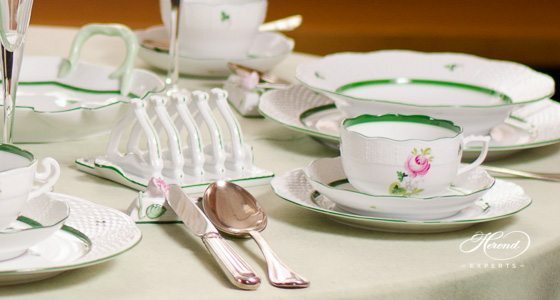 The first was made shortly after the introduction of the original RO pattern in the 1860’s. 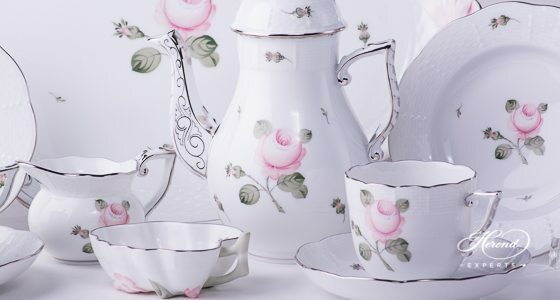 RO-ETB and RO-ETV Decors are available Tea Sets, Coffee Sets, Mocca Sets and Dinner Services. 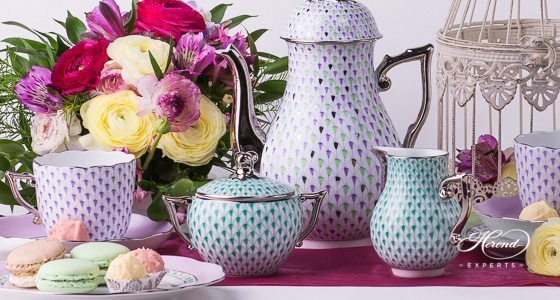 The Hadik Herend Sets are one with simplicity. 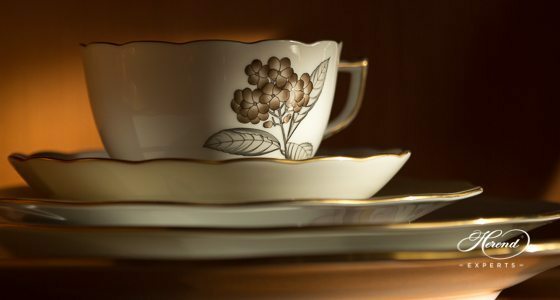 Only pure White and 24k. 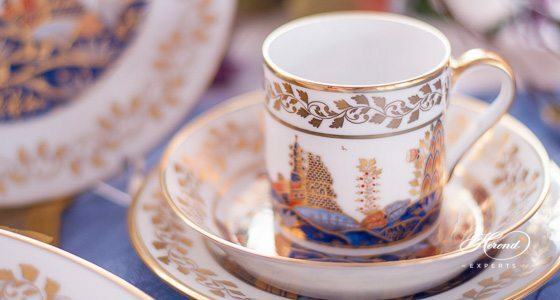 Gold are used for decoration. 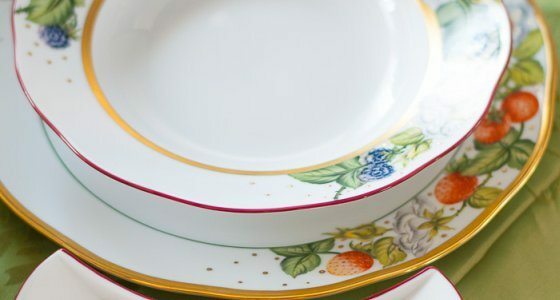 The texture of the Pure porcelain with the gold lines makes it a great choice for every type of table. 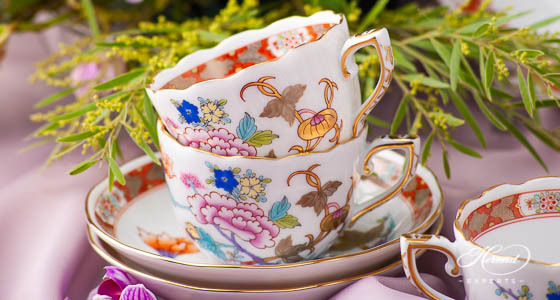 Tea Services, Coffee Services, Mocca Services and Dinner Services are available in this Décor! 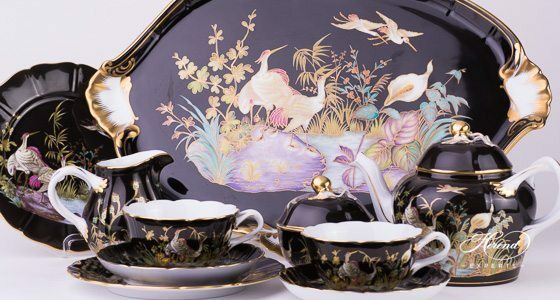 A decor with Far Eastern origins. 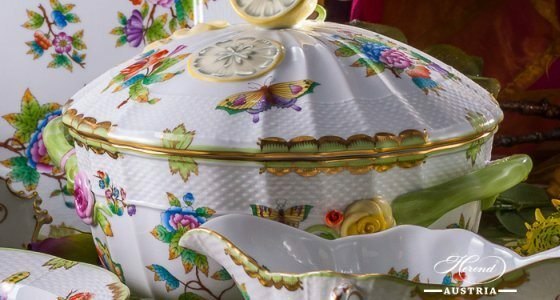 One of the most famous admirers of Indian Basket - Fleurs des Indes - was Empress Eugene, wife of Napoleon III. 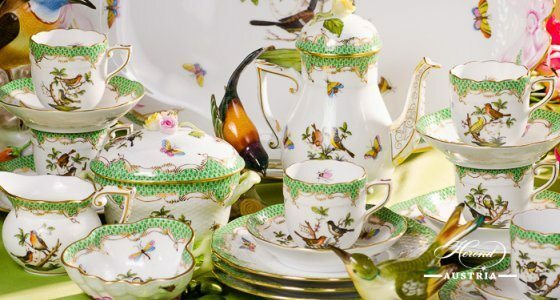 She used this service on the table of Elysee Palace when she gave a reception in honour of Emperor Francis Joseph at the Paris World Exposition of 1867. 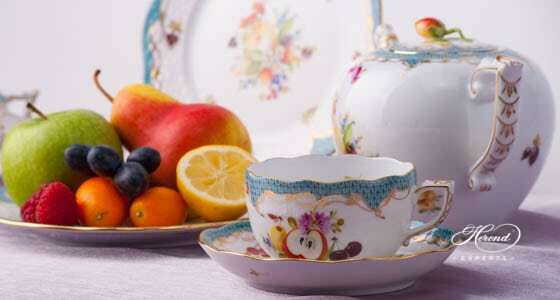 Since this time it is often called French basket as well. 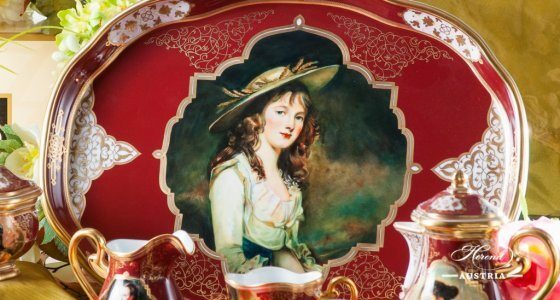 The famous Godollo decor of Empress Sissi. 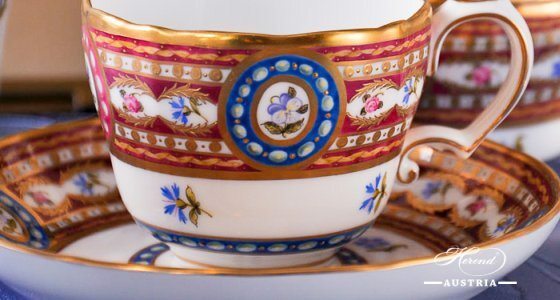 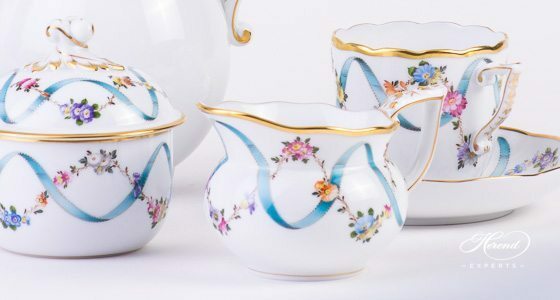 As the most important porcelain supplier of the Imperial Court in the second half of the 19th century, the Herend Porcelain Manufactory was authorised by Emperor Franz Joseph to use the patterns of the ViennesePorcelain Factory after it was closed down in 1864. 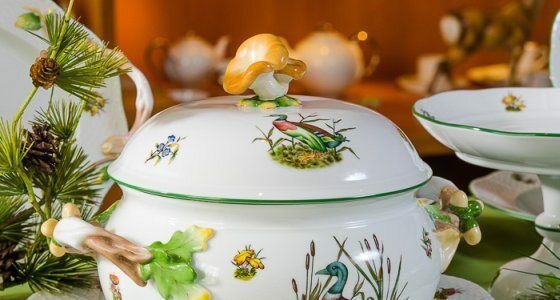 However, Herend artists did not simply adopt these motifs, but reinterpreted and adjusted them to their own painting style, as evidenced by the FODO - Oriental Showmen / Oriental Vendors pattern.